It is the glorious early days of summer vacation for my kids. Ryan is in his second week of hockey day camp, something we could not have imagined him doing just last summer. Riley is taking a summer enrichment program. As has been the case for the last several years, both kids have been assigned summer projects for school. We, as parents, made the judgement that the anxiety attached to these assignments for Ryan was not worth whatever marginal academic benefit they held. But this summer is different. Ryan, perhaps motivated by his academic success in eighth grade, perhaps because he’s trying to heed the warnings of the increased academic rigors of high school, is invested in completing his summer projects. He’s already finished with math, and moved on to language arts. The assignment involves reading a book and noting passages and words which are meaningful or which he doesn’t understand. 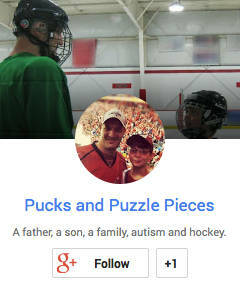 Veronica and Ryan chose the book together, and Ryan is reading The Curious Incident of the Dog in the Night-Time, the runaway best-seller about a young man on the autism spectrum who witnesses a crime, and his first-person description of everything that happens next. Since it is written in the perspective on a person on the spectrum, Veronica thought it might appeal, and make sense to Ryan. Two days in, that appears to be exactly what is happening. Last night, we watched in amazement as he took the book and a highlighter and decamped to the couch in our sun room to read for close to an hour. I read the book a few years ago and vaguely remember the details. Veronica is reading it in tandem with Ryan, catching up to the same point where he stopped each night after Ryan goes to bed. They discuss the passages he highlighted and his understanding of the book so far. He has a pretty good grasp on the story, and seems to be enjoying it. He has highlighted some passages that he finds meaningful, and been able to explain to us why. 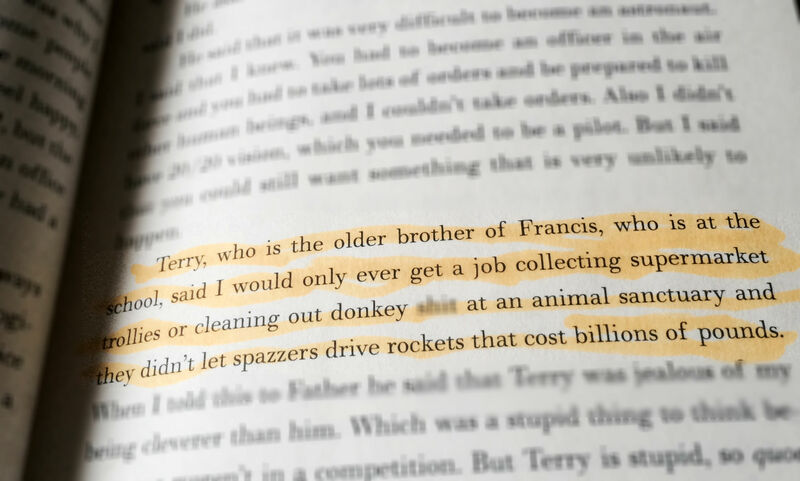 Terry, who is the older brother of Francis, who is at the school, said I would only ever get a job collecting supermarket trollies or cleaning out donkey s#&t at an animal sanctuary and they didn’t let spazzers drive rockets that cost billions of pounds. Ryan very clearly understood why that passage was important to him. He expressed his concerns about being able to find a job in a field that interests him if people don’t understand him. There was another passage he wanted to highlight about which he and Veronica argued. He felt very strongly that it was central to the story while she felt it was an ancillary detail. And it was ancillary … if you’re burdened with neuro-typical brain wiring. Father said that she died of a heart attack and it wasn’t expected. I said, “What kind of heart attack?” because I was surprised. Mother was only 38 years old and heart attacks usually happen to older people, and Mother was very active and rode a bicycle and ate food which was healthy and high in fiber and low in saturated fat like chicken and vegetables and museli. 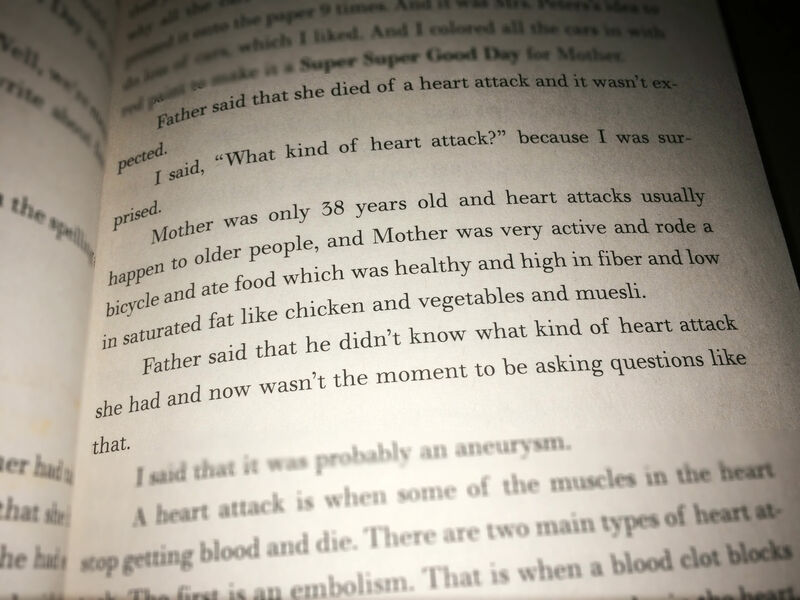 Father said that he didn’t know what kind of heart attack she had and now wasn’t the moment to be asking questions like that. If I recall correctly, in the grand story of the book, the details of how the mother died of a heart attack aren’t that important. But Ryan was very insistent. Ryan eats healthy and exercises constantly and to read about someone who does those things dying young of a heart attack does not fit with his worldview. As Ryan explained this, Veronica and I both had a, “well, duh” moment. Of course the passage was important to him. Veronica had encouraged him to read this particular book because she thought it might speak to him. Clearly, it had. Ryan continues to surprise us on a daily basis, so frequently that we should no longer be surprised. His understanding of the world and his place in it, his growing understanding of the differences in how he sees things and how others see him … evidence of these things crops up almost daily. Indeed, it is us, as his parents, who need to continue to learn to see the world through his eyes, so we can achieve the same level of understanding. Love this one – there is just so much good in this: the fact that Ryan wants to do the assignment, the choice of reading, the things that stand out to him. Great post, thank you! I had to read this book last summer for one of my SpEd classes. I absolutely love it! Maybe I’ll read it again. It’s interesting to see what Ryan thinks is important, and it would be fun to be a fly on the wall during class discussions about it.